Last week, I introduced you to the creativity-themed picture books of Peter H. Reynolds. I discussed The Dot and Ish, looking at how they relate to creative confidence and providing a few activities based on those books. Today, I’m finishing up my look at this series. I’ll be talking about two more in this collection, Sky Color and The Word Collector. First, we’ll take a look at Sky Color. You guys, this is my favorite of all of the books in Peter Reynolds’ collection. I can’t quite put my finger on why. It could be the gorgeous and inspiring illustrations, it could be the theme of looking beyond the ordinary. Whatever the reason, I love this book and I hope that you will, too. This one is about Marisol, a confident little artist. She’s so confident, she actually shares her artwork with those around her, supporting what she believes in and spreading happiness. She even encourages her friends to do the same, to get in touch with their own creativity. Marisol is so excited to work on a mural with her classmates. She enthusiastically volunteers to paint the sky, only to realize that there is no blue paint. What’s a girl to do? How can she paint the sky without blue? In the end, Marisol realizes that blue is not the only sky color. There are so many ways to paint the sky. She breaks out of the box, looking at things from a new perspective. This is something that we all need to do, from time to time. Even the most creative among us need to look through a new lens, think beyond the ordinary or expected way of doing things. Marisol shows us how to break free from convention and trust ourselves to create. I absolutely love The Word Collector because it takes a step away from art as a creative medium and focuses on words. It takes a look at how we use them, how we can create with them, and how to harness their power. In The Word Collector, we follow a little boy named Jerome. 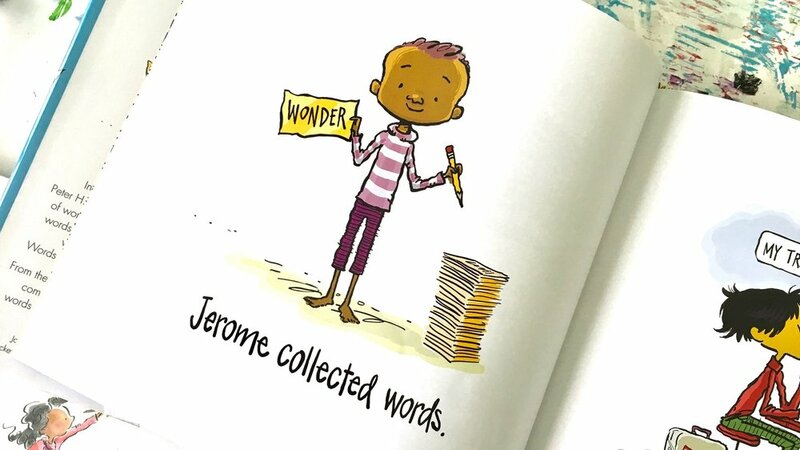 Unlike his peers, who collect things like stamps or comic books, Jerome collects words. He finds them in books, in conversation, everywhere he looks. He collects them in notebooks and boxes and carefully organizes them. He loves his words. Everything changes when Jerome is carrying his word collection and he trips. His words go flying, landing completely out of order. This could be a disaster, but it reveals something amazing! Jerome realizes he can put his words together. He can use them to make sentences, poetry, stories. He sees the power of his words when directed toward others. His love of words grows once he realizes their versatility. One day, he climbs to the top of a hill and lets his words go. He shares them with the world, which makes him happier than he can imagine. Words are powerful things. They can express our innermost thoughts. They can describe our feelings and experiences. They can help others to understand our point of view. Words can hurt. Words can heal. They are a powerful way to express yourself. Stringing them together, whether to tell a story, speak a truth, describe beauty or pull on the heart strings, gives us creative power. Our words are meant to be shared. It’s important for children to know that we are interested in their words. Start a conversation. Ask questions. Find out what words inspire them. Listen. This week, I have a number of Gently Guided Activities for Sky Color and just a few for The Word Collector. If words are more your thing, don’t despair! I have more word-based activities coming up in future posts. Those activities will connect right back to the themes touched upon in The Word Collector. Sky Color Activity #1 When I brought my activities to the co-working space, this one was the most popular. Can you make the sky without the color blue? I have put together a template that you can print out. Color the sky any way you want. Crayons, colored pencils, paint … but don’t use blue! Think about the many ways you can color a sky without blue. Will you choose something realistic, like a sunset or a cloudy day? Or, will you use your imagination, coming up with something we’ve never seen? Sky Color Activity #2 At the beginning of the book, Marisol uses her creativity to make others happy. She shares her work, knowing the power it can have. Try making a card or writing a poem to brighten someone’s day. Think about what images or words might make someone happy. Sky Color Activity #3 Draw a picture that deliberately changes an important color. What about making the sun blue? Or the grass pink? Does changing the color change how the picture makes you feel? Sky Color Activity #4 It’s not all about art. Write a poem about the sky. Take several days to jot down ideas as the sky changes over different times of the day and different weather conditions. What colors do you see? How do you feel? Are there shapes in the clouds? What does the sky make you think about? Write down whole sentences or just a few words at time. After you’ve been at it for a few days, take your favorite lines or words and string them together to create a poem. Sky Color Activity #5 Let’s give collaborative art a try. This would work well for groups as small as two and as large as you’ve got. Get a big piece or a roll of paper. Sketch a design and create a mural. Everyone gets to draw and color part of it. How do your individual styles go together? How do their differences add to the overall look? Need ideas? Perhaps a jungle or savanna scene with lots of animals. You could go under the sea or up into space. Pick a theme and let everyone come up with something to add. The Word Collector Activity #1 Jerome creates poetry by stringing together his words. Get a notebook to jot down words that you like, interesting words that you hear, words to describe your feelings or your observations of the world around you. Try stringing some words together, even if they don’t make sense. Don’t like what you’ve got? Try moving them around. Put the end at the beginning and the beginning at the end. Keep moving and changing the words until you’re satisfied. The Word Collector Activity #2 Create a list of some of your favorite words. Draw them. Some will be harder than others. Is it a feeling? You can still draw it. What color does it make you think of? Smooth lines or jagged? If your word is abstract, your drawing might be, too! Remember the lessons from last week and try to be satisfied with -ish. Let me know if you have any questions or comments. If you try any of the activities, I’d love to hear about it. Head on over to the Bonnythings Creative Facebook page to post pictures of your creations!